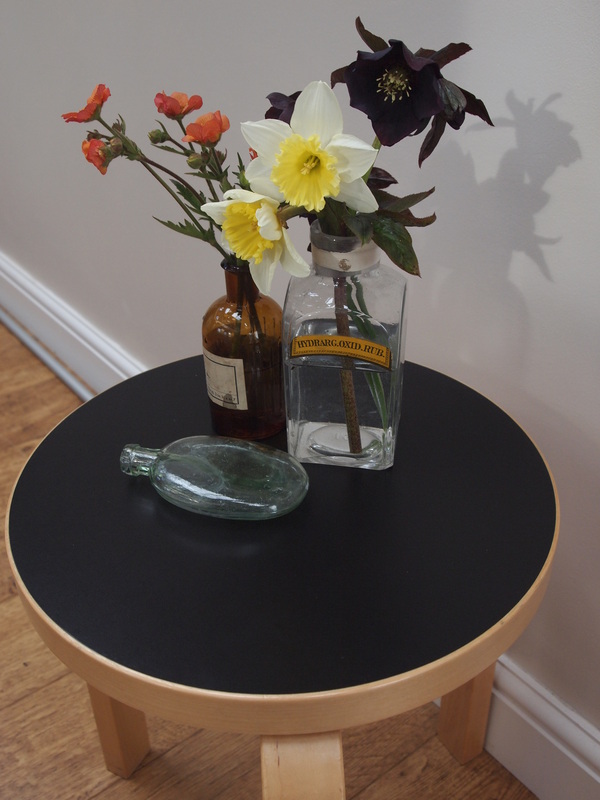 On a Monday I try to find something from the garden to put in a vase. This is in order to join Cathy and her meme at https://ramblinginthegarden.wordpress.com Gardeners and bloggers from the UK and elsewhere share their pickings for us all to see. As we come into Spring plants are beginning to pull away and the early Spring bulbs such as crocus and snowdrops are already over. I was to delighted to see that my geums have survived such a wet Winter and are now beginning to flower. 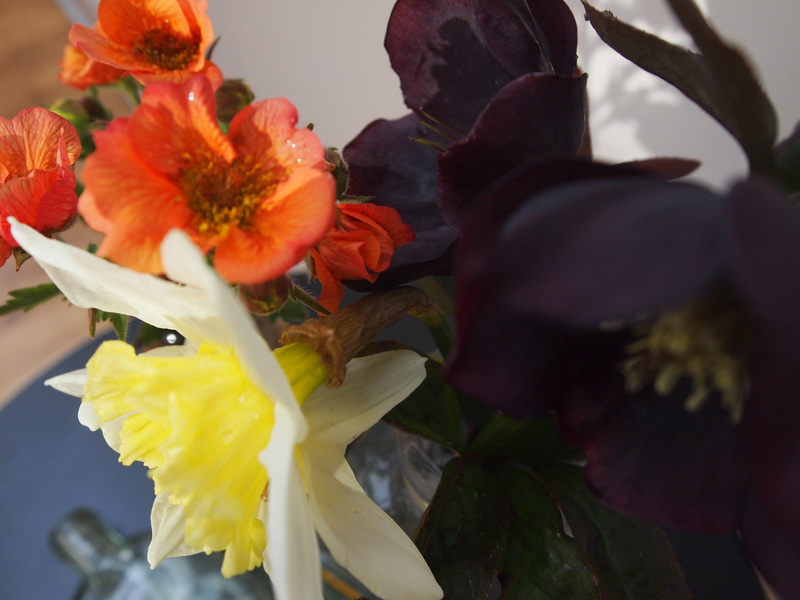 Oh how wonderful to see the geum already….it looks perfect in its vase next to the daffs. Thanks Donna. Such a great plant : it only finished flowering at the end of October. Nice vignette, Dorris. Great old bottles! Mrs Bradshaw is one of my favourite flowers, thats so early for her to appear, lucky you! I adore orange flowers and Mrs. Bradshaw doesn’t disappoint. She would be a standout in any crowd. Love your bottles too. Goodness, those geums are early aren’ t they? What a delight. Amazing as they have sat in water since about November. I love them and you are right , delightful. 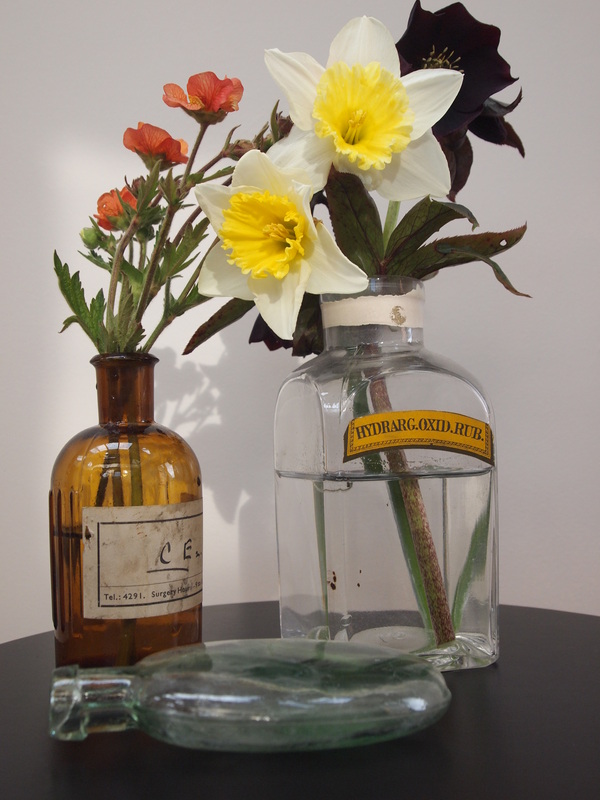 Geums have been very tough for me, I also have them as small yellow-flowering weeds, Doris. I’ve never seen Mrs. Bradshaw this early but did see some of the small ones blooming. Your super dark hellebore has an awesome color. Hi Hannah, the hellebore is a gorgeous dark colour, so lovely but of course does not like being cut. Only lasts a day in a vase. I am astonished mrs B is so early. I love the little yellow ones, weeds indeed. 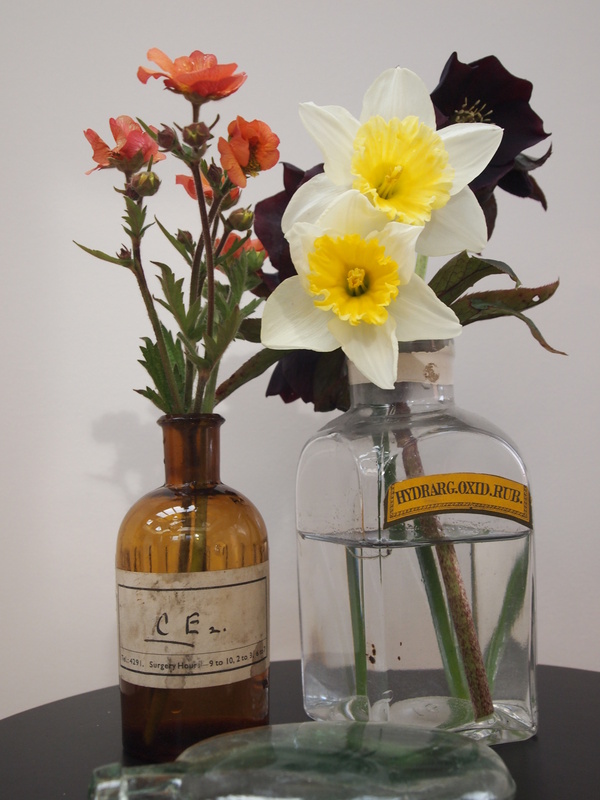 I love Geums but have never picked one for a vase… maybe this year! Yours are really early, aren’t they? Love the old bottles.